Welcome to the Emergency Services Day website, part of the National Emergency Services Memorial, a Registered Charity in England and Wales (1172996) and Scotland (SC048678). Emergency Services Day takes place on Monday 9th September 2019, with a series of events across the UK held on Sunday 8th Sept. The main national 999 Day event will take place in the City of Edinburgh in 2019! Click to read the press release. The Emergency Services Day will begin at 9am on 9th September annually (9th hour of the 9th day of the 9th month) with two minutes’ silence to remember emergency services personnel killed as a result of their duties. We’re humbled by the response to the inaugural 999 Day in 2018 and look forward to going to Scotland in 2019, Northern Ireland in 2020 and Wales in 2021! 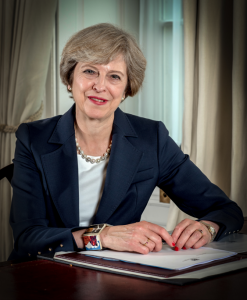 We are honoured that the Prime Minister of the United Kingdom, Rt Hon Theresa May MP has given her backing to this Official Emergency Services Day campaign, and to the National Emergency Services Memorial. We thank the Prime Minister for her support, we too thank her Prime Ministerial predecessors for their backing on the NESM campaign; David Cameron, Gordon Brown, Tony Blair and Sir John Major. The First Ministers of Scotland and Wales are backing the Emergency Services Day, as is the Home Secretary Sajid Javid MP, Health and Social Care Secretary, Matt Hancock MP, Police and Fire Minister, Nick Hurd MP, Leader of the Labour Party, Jeremy Corbyn and Shadow Police Minister, Louise Haigh MP. What is Emergency Services Day? Our aim is simple, to promote the work of the emergency services, promote efficiency, educate the public, and promote volunteering opportunities. Volunteers are an essential part of the emergency services and they play a core part in keeping Britain safe. Such volunteering roles include; Special Constables, Retained Firefighters, NHS Community Responders, St John Ambulance, RNLI, Search and Rescue and Coastguard volunteers. Whilst we are part of the Emergency Services Memorial, the 999 Day is an excellent opportunity for other emergency services charities to fundraise, raise their profile and participate in this event. Inspired by the Armed Forces Day, we are proud to support and promote the excellent work carried out by our emergency services across all four corners of the UK. To get involved in Emergency Services Day check out this page. 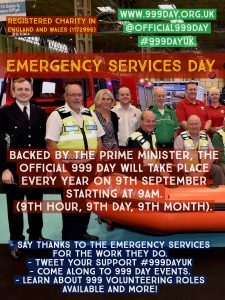 Why not also like us on Facebook: @Official999Day, and follow us on Twitter @Official999Day.